Because the linear regulator discussed here is an integrated circuit (IC), similar to other ICs such as operational amplifiers, it is associated with specifications that delineate its characteristics and performance parameters. A set of specifications also means governing standards, limits and criteria. The data sheet for a linear regulator provides a table of specifications (limit values), including such parameters as output voltages and the accuracy. A data sheet contains important information including the maximum rating, guaranteed operating conditions, and characteristics graphs, in addition to parameters. 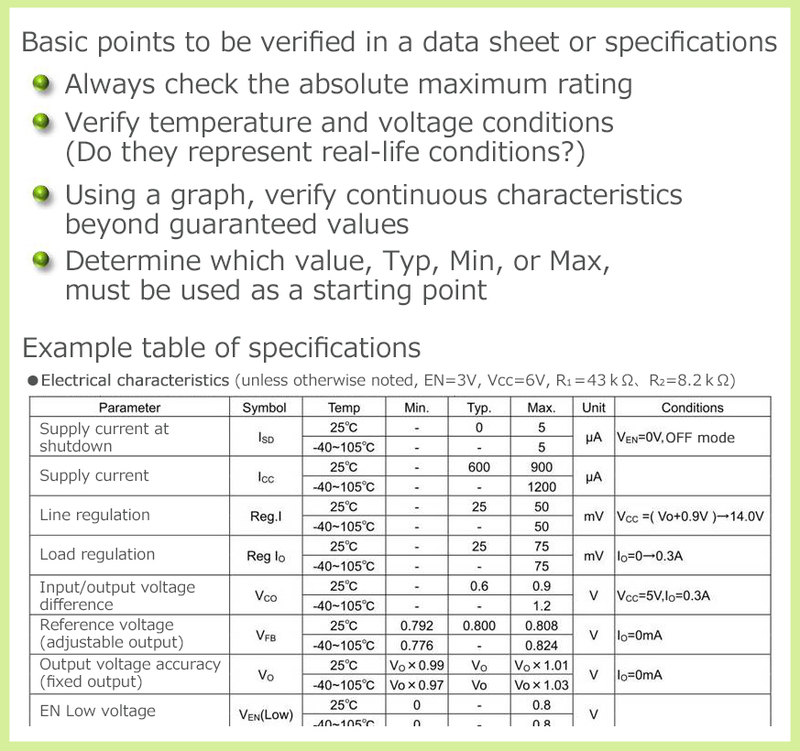 Figure 9 shows a basic data sheet, specifications verification points, and an example table of specifications. The absolute maximum rating is defined as a value that must not be exceeded even for an instant. Although some absolute maximum ratings may contain parameters, such as a short-circuit time that include the conception of time, basically the absolute maximum rating is a value that must not be exceeded for any time, and the value of an absolute maximum rating does not include any tolerance, such as ±5%. Occasionally readers ask, “What will happen if the maximum rating is exceeded?” or “What margin of safety is provided?” Although these questions may be of academic interest, given the intent of establishing an absolute maximum rating it would be pointless to dwell on these questions. What we must do is to use a linear regulator not to exceed the maximum rating or to consider using a linear regulator with a maximum rating that can tolerate operating conditions. It is critical to verify the conditions that ensure compliance with specifications, such as the applied voltage or the temperature. Actual operating conditions and the conditions specified in a set of specifications may not necessarily agree. As an example, if a condition states Ta=25℃, the guaranteed value is always that which prevails at Ta=25℃. 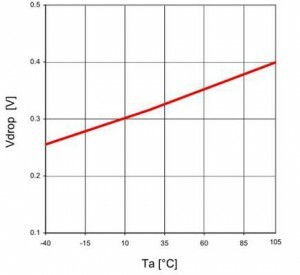 In actual operations, however, except inside a constant temperature chamber, it would be unrealistic to assume the prevalence of a condition in which the temperature remains constant at Ta=25℃. Consequently, when looking at a specifications value, it is necessary to verify whether the stated value specifies a value at one point or in a certain range, such as a value that remains valid at guaranteed operating temperature range, and verify a value under actual operating conditions or a value under conditions that are close to the operating conditions for the device being designed. For this purpose, characteristic graphs that are provided with the linear regulator may prove useful. As a final point, a specifications value may be stated in terms of a minimum value (Min), maximum value (Max), or typical value (Typ), or by a combination of all these values. Among these, that which is guaranteed is the minimum and maximum values. Based on a characteristic distribution or statistical method, a typical value only means “the majority of value.” The question now becomes: given that a linear regulator is designed based on specifications, what values must be used in the design? Naturally, typical values may be used. In principle, values that produce worst conditions should be chosen, based on the engineer’s expertise and experience levels. In this subsection, we explain the following seven items that require a solid understanding and consideration among the linear regulator specifications. It does not go without saying that other specifications can be ignored. Beyond linear regulators, the careful study of data sheets is a critical requirement for engineers. ・The absolute maximum rating is a critical item that must be adhered to. ・In design work, values that are guaranteed in a full operating temperature range are useful. ・Typical values must be distinguished from guaranteed values. ・A careful study of data sheets is extremely important in any design project, beyond the power supply IC. For the input voltage range, check two values. The range indicated in a maximum rating only represents “input allowed,” meaning that a voltage up to this point may be applied, not necessarily that the IC can operate in the indicated range. Identify a voltage which is not a steady-state voltage, and verify that it falls within the indicated range. In addition to a maximum rating, there are items called an operating input voltage range and recommended input voltage range. These ranges must also be used as frame of reference. Figure 10 describes the relationship between an input voltage range, an output voltage range, and a dropout voltage. The Effective input voltage range may be defined as from output voltage + dropout voltage or greater up to the maximum input voltage. Since linear regulators can only perform step-down operation, the input of a voltage which is output voltage + dropout voltage or less will not drive the linear regulator properly. What will happen when a voltage less than this value is input depends on the circuit configuration of the IC; however, in most cases the IC will produce a voltage approximately equal to input voltage – dropout voltage. There is no guarantee, however, that such an output voltage is regulated. If the input value declines further, at some point in general behavior, the output voltage may suddenly drop down to 0V. In some battery-driven operations this range may be used in applications where the circuit is powered and operated up to the very limit of battery power supply. ・Set up input/output conditions with a solid understanding of the relationship depicted in Figure 10. The output voltage range is specified for an adjustable type regulator, not for a fixed type one, such as 5V. The output voltage range refers to a voltage range that can be set as an output voltage for adjustable type regulators. In an output voltage range, basically the minimum voltage for which an adjustable type can be set will be VREF. The VREF refers to a reference voltage for comparison purpose which is connected to the error amplifier input, discussed in Subsection 1-1), Operating Principles. From the operating circuit, it may be clear that a voltage lower than a comparison voltage (VREF) cannot be regulated. The VREF, which is a part of the IC, cannot basically be modified externally. Generally approximately 0.8V VREF is used in CMOS linear regulators, and approximately 1.2V in bipolar linear regulators. Notice that in applications that require a 1V output, for example, a 1.2V VREF should not be selected. 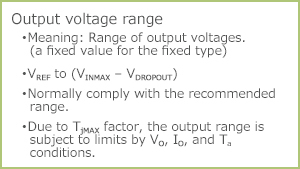 Returning to the output voltage range, the minimum voltage is VREF, and the maximum voltage is equal to maximum input voltage (VIN MAX) – dropout voltage (see Figure 10). The input/output conditions can be determined by calculation based on the above relationship, subject to power loss. If a thermal calculation is made so that the TjMAX is not exceeded, tradeoffs may be needed depending upon the VIN, VOUT, IOUT, and Ta conditions. 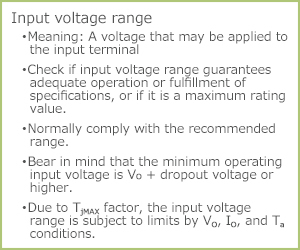 ・Normally, a voltage lower than VREF cannot be set as an output voltage. ・Depending on set conditions, heat loss cannot be allowed. If this is the case, verification must be made by performing thermal calculations. The output accuracy is equal to the allowable error for the fixed-output type output voltage. Years ago the typical error was ±5%; nowadays, there are many high-accuracy linear regulators featuring ±1%. The output accuracy is closely related to the temperature and output current. Because in real life a linear regulator is not used exclusively at 25℃, specifications covering a full temperature range must be considered. For the adjustable type, the accuracy of VREF may be applicable, which is the accuracy of the IC itself. The output voltage for the adjustable type is set by external resistors. Consequently, the output accuracy of the adjustable type is equal to the accuracy of VREF plus the error inherent in the set output resistors. ・The output accuracy of the adjustable type is equal to the accuracy of VREF plus the error inherent in the set output resistors. ・For general-purpose voltages, the use of the fixed type is recommended, which guarantees an adequate output accuracy while eliminating the need for two resistors. The specifications for an output current are parameters that guarantee a minimum current that can be output. Basically, for most linear regulators a minimum value is specified. Some data sheets use the phrase [output current limit]. The English term [Limit] conveys the meaning of limit, rather than restriction. If a minimum value is guaranteed, it means “guaranteeing a minimum current value”. Consequently, in actual applications a current greater than this level can flow. There have been cases where, the engineer mistakenly believed that a limit meant that a constraint was provided so that no current exceeding the limit would be generated, and the engineer ended up with a damaged part as load. So, adequate caution may be in order. Also, for some ICs minimum and maximum levels are specified. In such a case, the maximum level means that the current will be restricted. If the restriction is of vital importance, to be on the safe side it would behoove to ascertain with the manufacturer of the IC. The question may now arise as to whether a guaranteed output current can always be utilized. The answer may be, “It depends.” A guaranteed output current is determined by a combination of input/output conditions and ambient temperature conditions. For a linear regulator, thermal calculations are always necessary, and we must remember that it is one of the critical control items. As similar specifications, for some linear regulators a short-circuit current is indicated. The short-circuit current means the maximum current that flows to the ground when the output terminal is grounded, or shorted to the GND. Given this current, it may be possible to determine what action is to be taken in the event of a short-circuiting in a worst possible scenario. Most linear regulators are provided with a protection feature to guard against an output short-circuit, a typical of which is thermal shutdown which turns off the output current when an above-the-limit chip temperature is detected. This feature prevents the linear regulator chip from rising above the limit temperature (in most cases approximately 150℃); consequently in most cases chips are not destroyed by the temperature. However, when the temperature of the chip declines, the linear regulator automatically restores itself (latch-off type exists, too). If the problem arising in the load is not eliminated, the linear regulator begins to supply a current, and passes a possible large output current intermittently to the load. Consequently, in some cases the integrity of the load itself may not be protected. ・Check the applicable item in the data sheet; verify whether the item refers to a maximum or minimum value. 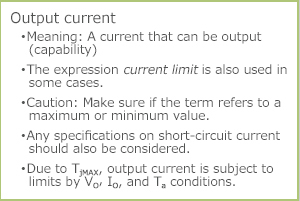 ・Because a specified output current may not always be available, it is subject to limits by the input/output conditions and TjMAX. 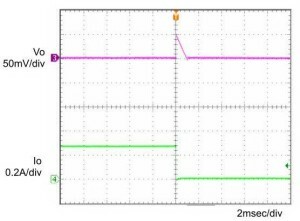 ・Be sure to ascertain how a linear regulator will behave in the event of an over-current or short-circuit (maximum current, thermal shutdown, latch-off, and so forth). 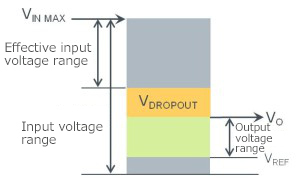 The dropout voltage refers to the difference between the input and output voltages necessary for the linear regulator to perform regulation operation. Although the term is sometimes expressed as a loss voltage, according to the definition of loss voltage provided above, if the input is 12V and the output 5V, the dropout voltage is different from the 7V loss voltage. In terms of where the word dropout is derived from, when the input voltage approaches the output voltage, the linear regulator is unable to maintain regulation, and the output begins to decline in proportion to the input. In English, this state is expressed as a dropout, and it seems that it is the voltage at which the linear regulator assumes this state, that is, the difference between the input and output voltages necessary for the linear regulator to perform regulation (reasonable people may differ on this point). We now show Figure 10 again that depicts the relationship between the input/output voltages and the dropout voltage noted previously. As was explained in Subsection 1-3), Linear Regulator: Its Circuit Configuration and Features, the dropout voltage varies with the circuit configuration of the IC. LDO represents a circuit configuration that produces a lower dropout voltage than the conventional type. In terms of a simple relationship, the lower the dropout voltage, the linear regulator can operate at an input voltage closer to the output voltage. This is an important requirement for battery-driven applications in which the input voltage is subject to fluctuations. Conversely, for applications that generate 5V from 12V, the dropout voltage is not important. Incidentally, would it be the case that the lower the dropout voltage the higher the efficiency? This question will be answered later. The graphs in Figures 16 and 17 depict the relationship between the dropout voltage, the output current, and the temperature. Clearly the dropout voltage is a parameter that fluctuates as a function of temperature and output current. 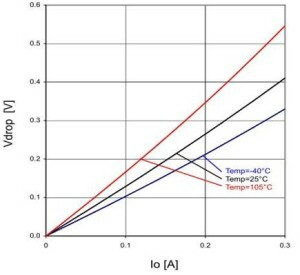 A linear regulator designed to the limits under normal-temperature specifications could fail to operate at high temperatures. Beyond the dropout voltages, the characteristic graphs provide vitally important information. ・A solid understanding of the relationship depicted in Figure10 is imperative. ・Because the dropout voltage fluctuates significantly by temperature and output voltage, avoid a condition in which the regulator ceases to operate at a minimum input voltage. Figure 19. Example of a rapid increase in load current. The output voltage, declining instantaneously, recovers with ringing. When the output voltage fluctuates due to a change in load current, the linear regulator tries to return the output voltage to a prescribed voltage. The length of time from the change in output voltage until it returns to the original voltage is referred to as a transient response characteristic. Strictly speaking, it is a load transient response characteristic. You might ask, “Isn’t the job of a regulator to regulate voltage?” To be sure, regulators perform regulation operations. That said, aside from regulators, when subjected to a state change, any device requires some time to respond to a change. When the output load change is extremely fast, the response by the feedback (regulation) loop of the linear regulator is unable to catch up with it, and this produces a phenomenon in which the output voltage falls when the load current increases rapidly, and it rises when the load current declines suddenly (see Figures 19 and 20). Figure 20. 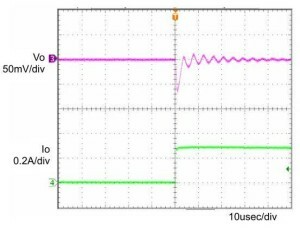 Example of a sudden decline in load current, the output voltage rising instantaneously. For these reasons, in applications where the load current changes suddenly, the transient response characteristics are of vital importance. When the output voltage changes substantially due to load fluctuations and the recovery of the original voltage is slow, problems might arise such as an unintended resetting of the circuit or generation of data error. To minimize the possibility of these problems, a linear regulator with favorable transient response characteristics needs to be selected. While the switching regulator, more on this later, has similar transient response characteristics, those of the linear regulator, under continuous loop control, are relatively fast. In most cases however, transient response characteristics are not guaranteed in terms of a set of specifications, due to the difficulty of establishing standard levels since the transient response characteristics are at the mercy of output capacitance and interconnection inductance. Because in some cases the characteristics of a standard example circuit are provided in the form of a graph, such graphs can be used for reference purposes. As noted above, because the characteristics can vary by the PCB layout, ultimately the transient response characteristics of a linear regulator should be determined by taking measurements on an actual application circuit board. ・When there is a rapid change in load (output) current, the output voltage fluctuates, and the process of returning to a normal state requires time (response time). ・When fluctuations are excessively large, the threshold level of the power monitoring function can be exceeded, with the result in an unintended reset operation. 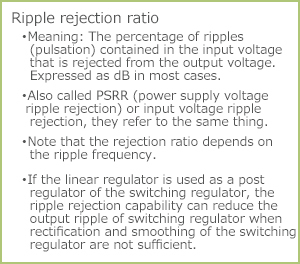 The ripple rejection ratio is a quantity describing the extent to which the input ripple voltage can be eliminated in the output. Although this quantity is referred to as PSRR and input voltage ripple rejection, the terms mean exactly the same thing. The ripple rejection ratio is commonly expressed as dB. A ratio of 60 dB, for example, means that the input ripple is reduced to a 1/1000 factor. A 100 mV ripple is reduced to 0.1 mV. The ripple rejection ratio is an important factor when the input ripple is large. Due to the increasing popularity of switching regulators, nowadays even noise-sensitive applications use switching regulators for efficiency reasons. However, in applications where little compromise is allowed in S/N, the ripple rejection feature of the linear regulator is sometimes employed in order to eliminate the switching noise (ripple) occurring on the output from the switching regulator. 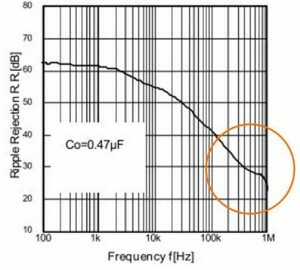 While this may be an effective approach, the ripple frequency of the input and the frequency characteristics of the ripple rejection ratio need to be evaluated carefully. Generally, ripple rejection performance declines as the frequency increases. Consequently, the ripple rejection feature of the linear regulator may not work well when the ripple frequency is high. Figure 21 illustrates the ripple rejection characteristics of a commonly available linear regulator. The rejection ratio declines with respect to the frequency, such that at 80 kH the ratio is approximately 8 dB, amounting to only a 1/2.5 rejection. By contrast, the switching frequency of a switching regulator has increased from hundreds of kHz to mega Hz. If a ripple in a 600 kHz switching regulator is 100 mV, a 40 mV ripple still remains after the rejection. Recently linear regulators with improved frequency characteristics have become available. 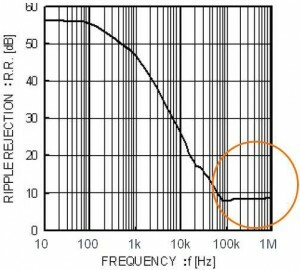 In the example in Figure 22, at 600 kHz since the ripple rejection ratio is 28 dB, at a 1/25 rejection ratio such a linear regulator can pare down the ripple to 4 mV. ・Originally, this was a function to reduce ripples after rectification and smoothing. ・When connected behind a switching regulator, the linear regulator can reduce the switching ripple, depending upon the prevailing ripple frequency.